The Black-rumped Waxbill (Estrilda troglodytes Lichtenstein 1823) is a small bird belonging to the order of the Passeriforms (Passeriformes), family of the Estrildids (Estrildidae), genus Astrild (Estrilda), species Estrilda troglodytes. The name of the genus “Estrilda” comes from the Old Norse and means Eros and Cupid. It has probably its origin from seventeenth century writings by the Swedish poet Georg Stiernhielm. Since then, the epithet has been utilized in the Nordic poems, especially during the Baroque and Rococo periods. The name of the species “troglodytes” was coined in 1775 by the famous German anthropologist Johann Friedrich Blumenbach (1752-1840) for the common chimpanzee (Pan troglodytes) seen that in Greek this epithet means “he who lives in the caverns”; term here resumed by Lichtenstein in 1823 with reference to the closed nests, built by these birds, which show a small elongated entrance, as often is the case in the caverns, and one or two cells. This species is distributed, in natural way, in an ample central belt of Sub-Saharan Africa. It is present, with abundant to very scarce concentrations, in all the regions bordering the Desert of Sahara. It has been also introduced, willingly or accidentally, in many other parts of the world, such as in France, Spain, South America, Japan, Hawaii and Lesser Antilles. The Black-rumped Waxbill is a small bird very lively and active. It usually moves in flocks, even of some tens of individuals, emitting a repeated vocalization for keeping in touch with the rest of the group. They live in various habitats: from the arid locations to the humid ones with open prairies and scattered bushes. The Black-rumped Waxbills move flying low and hopping, even in open areas looking for the seeds produced by the herbaceous plants. While looking for food, they fly from a tuft to another alighting on the stems of the herbs and carefully looking around. In addition to the seeds, gathered even directly from the inflorescences and from the spikes of the plants, they may nourish of small insects such as aphids, gnats or others. They have a mild and calm look and when they are busy in feeding they can even approach just a few metres a respectful observer. The Black-rumped Waxbill is about 9-10 cm long and weighs 6-10 g; it has a very elegant shape and look also thanks to the rather elongated tail. As some local names recite, it has the beak of red “coral” colour and has an always red belt, slightly more intense than that of the beak, which starts from the sides of the beak itself, crosses the eye surrounding it and goes on behind the sides of the nape tapering slightly and ending in a little truncated tip. The livery is grey-brownish with powder-pink shades more evident on the nape, under the chin and on the belly. A more intense pink spot is present on the ventral part of the trunk, in the rear position, more or less starting from the chest, passing in the middle of the junction of the legs and continuing back. The tail (rectrices and rump) is dark brown/black but the two lateral edges of the outer rectrices, which are white. The under tail is of creamy white colour. On the whole trunk of the body we see on the animal, when observed closely, some very thin grey-brown strikes-zebra lines slightly more intense than the basic colour. The juveniles have blackish beak; do not have the lateral red bands on the head and even the pink hues and the thin strikes are absent. 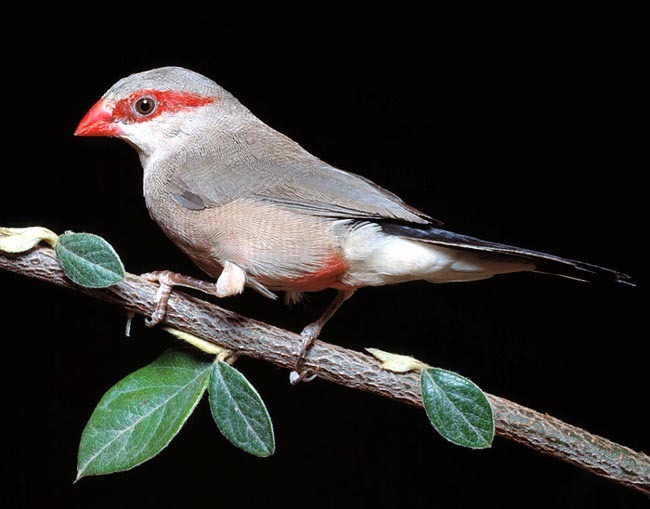 This species is sometimes mistaken with the Common Waxbill or St Helena Waxbill (Estrilda astrild) which actually is a species with a much similar appearance sharing also, partly, the same habitats. 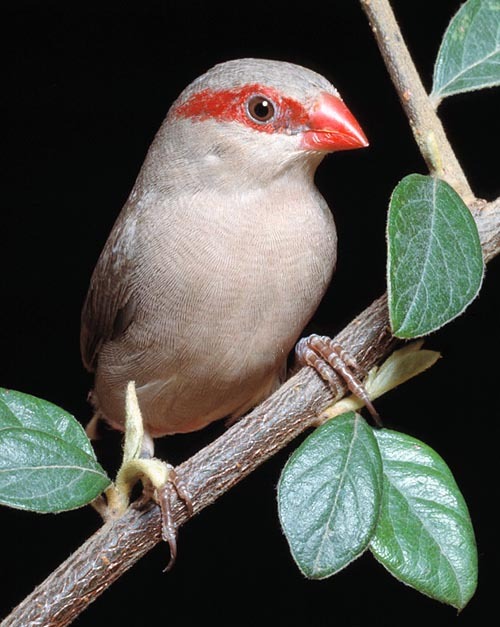 The St Helena Waxbill, if compared to the Black-rumped Waxbill, has the zebra lines of the body more evident, does not have the lateral white border of the tail and the reddish spot on the chest. The sexual dimorphism is practically absent: the female seems to have the ocular band very slightly shorter and narrower. The sexes can be distinguished by the behaviour of the male in parade, singing and courting the female, hopping aside and in front of the same and holding a thin sprig or a blade of grass n the beak. The reproductive pairs do often form ex-novo by the time of the reproduction. The nest is built on bushes or amongst the tufts of grass, very often at few tens of centimetres from the ground or at its level. The nest is built with thin vegetal material such as twigs and grass blades; it appears mimetic and done in an elaborate way. It has the shape of a slightly elongated sphere with a frontal tubular entry hole and which protrudes slightly outside thus forming a short antechamber. At times, in the nest is observed a second chamber (considered as the chamber where the male rests and keeps watch) which may be built also on the “roof” of the real and proper nest. The hatching is formed by 2-6 white eggs of a slightly elongated shape. The brooding lasts about 11-12 days and is done by both parents. The newborns are inept, of brownish yellow colour, with sparse hairs and have buccal papillae useful for being feed by the parents. The newborns of this species, as well as those of many other species of granivores at the beginning of their life, need to be nourished with a strong integration of insects. They keep in the nest 15-20 days and assume the adult livery by around the second month of life. This small bird is often bred in captivity and recently was imported in huge quantities impoverishing the wild populations. In a domestic habitat, these small birds live peacefully with other species, are very lively and rustic, but for reproducing, they need spacious and well furnished aviaries where to build the nests in a natural manner.